I would love to introduce a guest tutor, Jenny Gropp, who comes to us from One Krafty Kat. 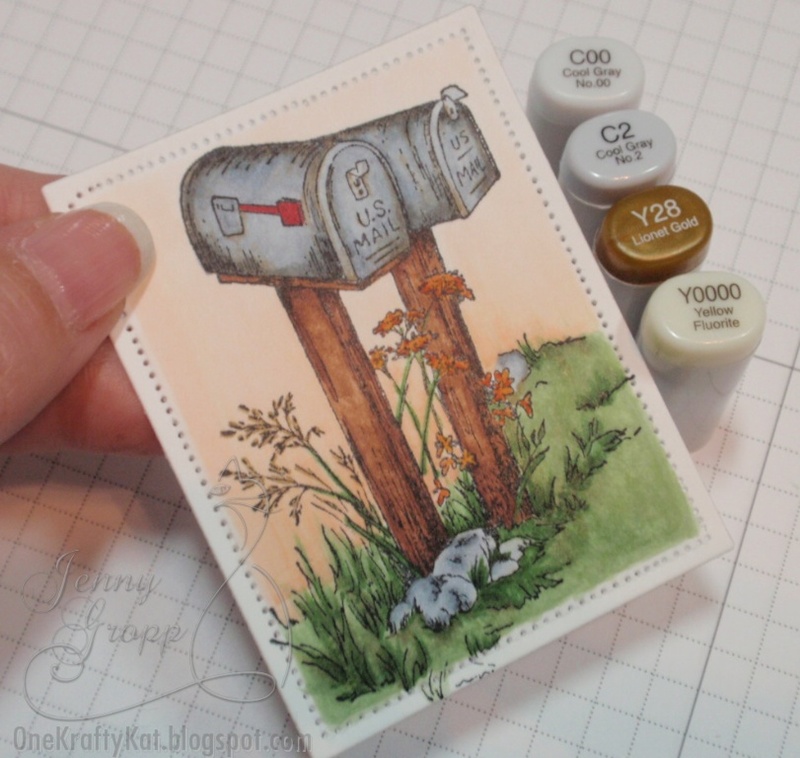 Jenny has generously offered a fantastic Copic coloring tutorial for us today on this beautiful card. I just know that you guys will love her style as much as I do! Jenny used a stamp by Serindipity Stamps... the owner of Serindipity, who is a big fan of Operation Write Home, was so pleased that they are also offering us a really great coupon this week to go along with Jenny's Tutorial! Check out the tutorial for details! Please leave some love for Mz. 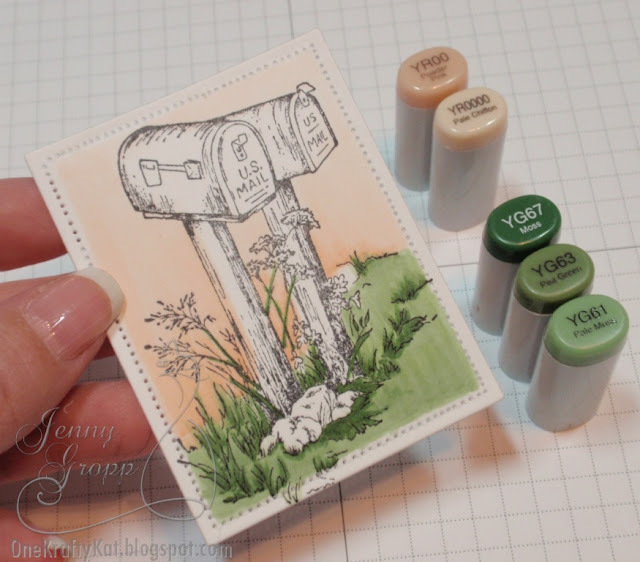 Jenny and Serindipity Stamps at the end of the post! I wanted to share a card today that I made for Operation Write Home. OWH is a fantastic organization! They collect hand crafted cards that people like me and you create and send in to them.... they package the cards up and send them overseas to our troops. Our Soldiers then have special hand made cards to use when writing home to their loved ones. 1,615,628 handcrafted cards have been deployed since 2007! When creating cards for OWH, they have a few guidelines to take in to consideration. Please visit the OWH Website and find out more! OWH also features challenges and fantastic tutorials regularly on their Blog as well. 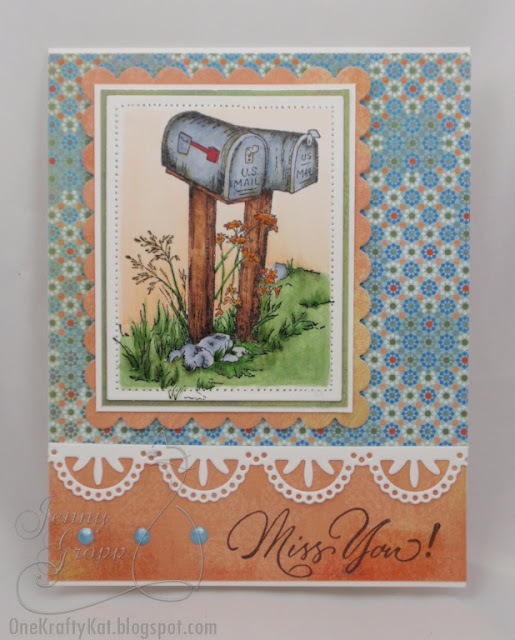 So please be sure and check out the OWH Blog - Stars and Stamps. The stamps I used today are from Serendipity Stamps and you can shop online with a special discount code! Shop at Serendipity Stamps and just enter the code "40FROMHIGH" during checkout and you'll get 40% off the single highest priced item in your cart. Coupon expires Monday May 21, 2012. One coupon per customer. 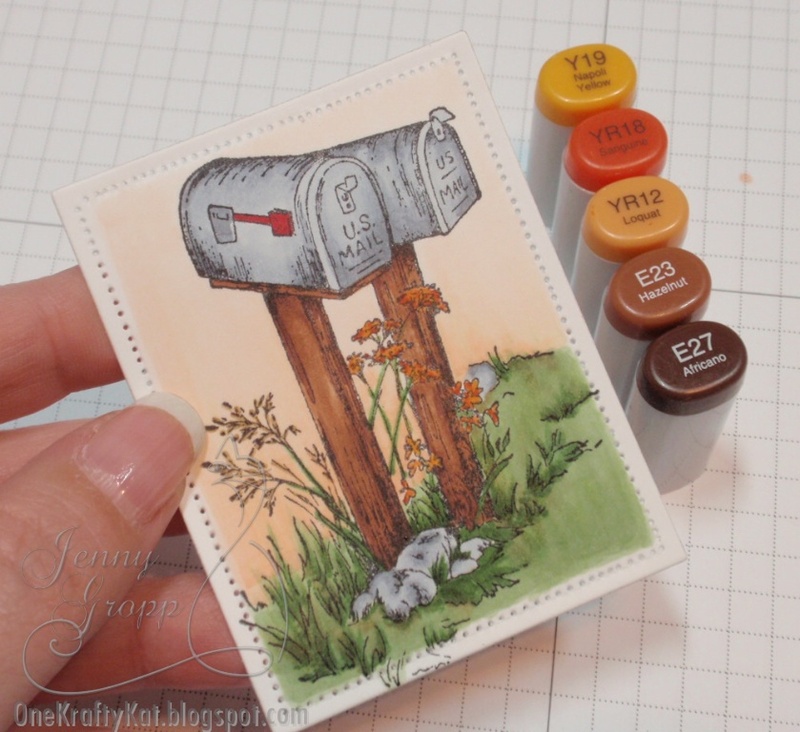 I chose this great new image from Serendipity Stamps called Mailbox with Wildflowers. I thought a Miss You sentiment with the mailbox would make a good card for someone to send home. I used pattern paper from an older Basic Grey 6x6 Collection - Marrakech. I stamped the mailbox image on Neenah Classic Crest Solar White using Memento Tuxedo Black ink. I used a Spellbinder's Rectangle Nestie to cut out the image. After cutting it out, I left the image in the die and used the inside edge of the die as a guide line to add piercing around the edge. I do use a piece of scotch tape to secure it and keep it from slipping in the die. Above, you can see I added the piercing all the way around the inside edge, then I removed it from the Spellbinder's die. First I used YR00 in upwards strokes from the grass line. Working in vertical strokes again I softened the color going upwards using YR0000. To start on the ground I used a combination of YG61, 63 and 67. These are some of my favorite greens for grass/leaves. I used Y28 on the wheat looking flowers on the left, just barely touching the paper to add a little color to them. I also used Y28 to add a little touch here and there in the grass. C5 and C2 for the rocks and the mailbox. Next came the posts and the flowers. The flowers were so small, not much of an area to blend multiple colors, so I just used small dots of the YR's and then smoothed them together using Y19. E23 and E27 for the mailbox posts. Final steps in coloring... 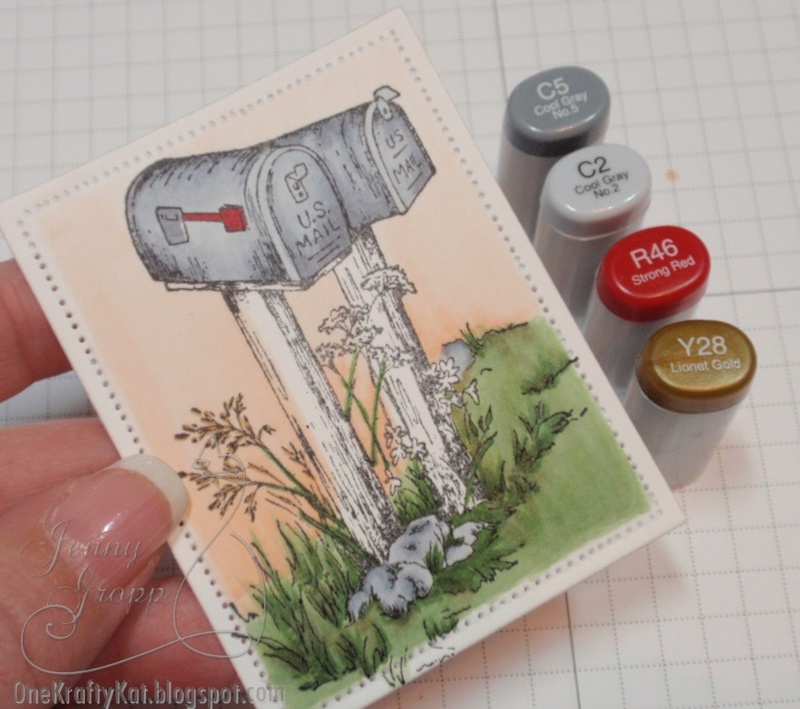 I used Y28 again and added little touches to the mailboxes, to give them a more weathered outdoorsy look. I smoothed the colors on the mailbox with C2 and C00. I used Y0000 to dab at the grass and the wood posts.... removing color is small spots, giving it a bit of texture. The cards for OWH need to all be uniform in size... standard A2, 4 1/4" x 5 1/2". The white folded card opens at the bottom tent style. The orange strip at the bottom is 1 1/4" x 4 1/4". The blue quilt pattern paper is 4" x 4 1/4". I used a Memory Box die, Meridian Border, to cover the seam where the two papers meet. The pattern papers dont quite reach to the top/bottom of the card base, leaving a small white border exposed. I used Perfect Layer Rulers to add small 1/16" layered mats to the image and then framed it with the scalloped rectangle nestie. I popped the image with foam tape and added a few small pearl embellishments. I skipped my usual bow on every card today, due to OWH's suggestion that the cards should not be to bulky for mailing purposes. Thank you, Jenny for joining us today!!! What beautiful coloring work on this image and the papers and details are so perfect with the image. Gorgeous work! Thanks so much for this great coloring/creating tutorial Jenny! The card is fabulous!! 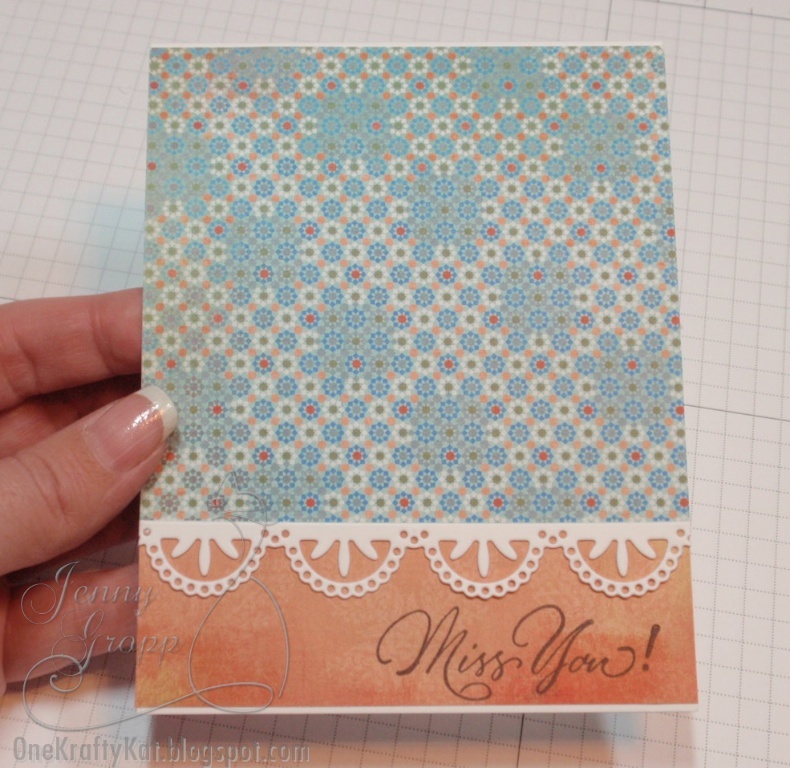 This is a lovely card and a great tutorial! 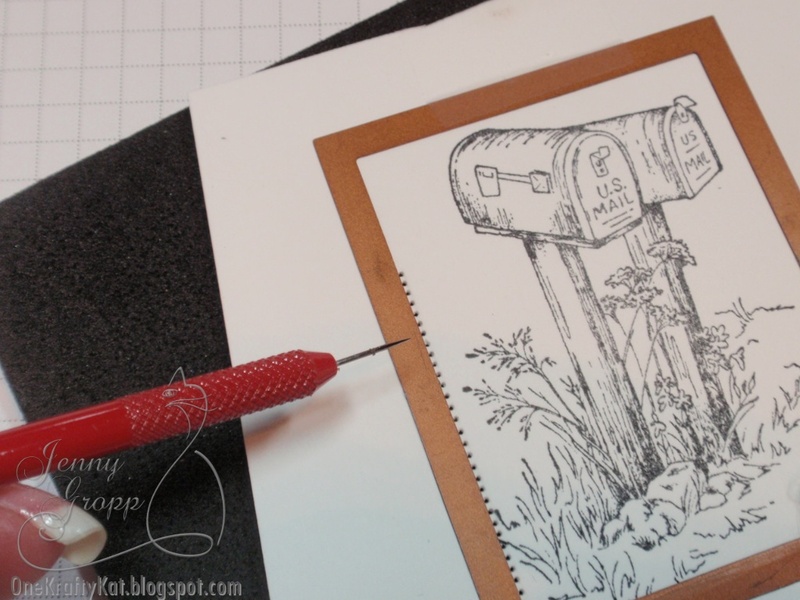 I love the paper piercing tip and the way you've colored the image! Thanks so much for sharing your talent! 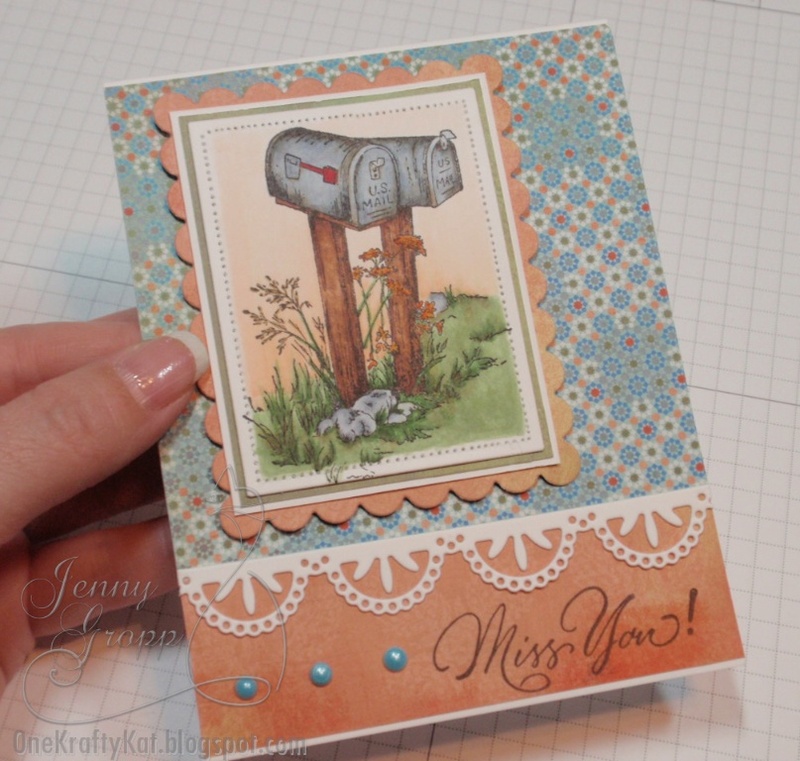 Jenny, your card is beautiful and your tutorial is full of info and tips! 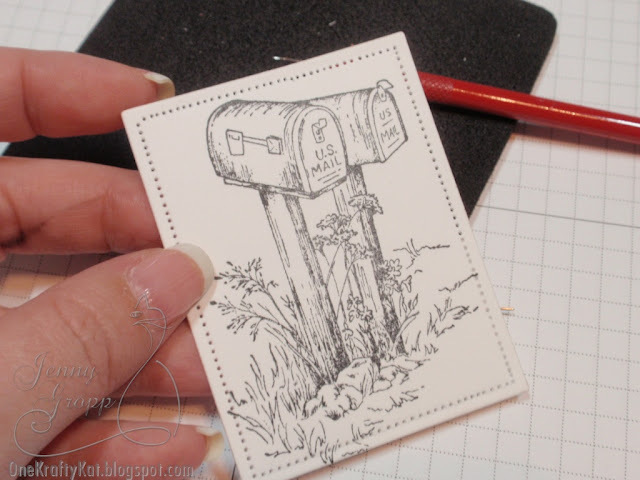 What a great special offer from Serendipity stamps, too! Great fun. Beautiful card, you did a great job! A VERY PRETTY CARD. LOVED YOUR TIP ON THE PAPER PIERCING. THANK YOU SO MUCH SHARING.